3. BODY-DIAGNOSTIC, Illness Stage: This stage has to do with changes in physiological-anatomical structures including changes in chemistry. This is where today’s allopathic doctor begins his or her diagnostics and treatments. However, at this last stage of health-wellness disturbance, all three stages are present. This explains the side-effects of medicines, for medicines are needed to treat the specific areas of structure change. However, to be effective, these treatments must be strong and pinpointed; and thus, affect both the communication and the functions of the individual’s entire body-mind physiology. These are often referred to as side-effects of the medicines. To correct these side-effects, further medications are prescribed and, in turn, create more miscommunications and abnormal functions. What is needed is the combination-integration of all three stages of corrections and treatments. This is what we refer to as the integration of medicine. 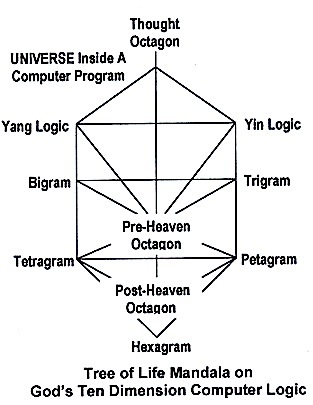 THE FIRST CAUSE (Logic-Information Universe, Symmetry Break → Self-Program the Vacuum Computer in 10-D Logic plus free will): All Matter-Being Objects exist in 10-D Logic as modules within this Program. The various paths inside this tree of life describe the observer-observed interfaces are encoded inside the module. These modules are non-locally connected in sets of 10-D tree of life logic with the 1-D of free will. This is the spirit-universe of Logic. THE SECOND CAUSE (Information-Energy Crossover between the Logic Vacuum and the Information Vacuum Symmetry Break → 10-D Logic in a Tree of Life Mandala onto 10-D Superstring Topology): The information-Energy Universe formed from the free will executions of the modules and their paths within the Universe Computer Program. This is the soul-universe of becoming. The mind of the soul, it directs the physiology of the spirit by giving instructions to the acu-point networks in control of one’s body-soul-spirit physiology. 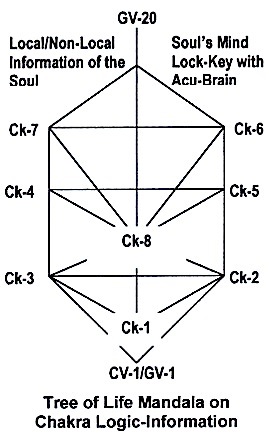 This Acu-Brain, the ten sephiroth mapped onto the ten acu-points shown above, has been preliminary tested for pain (with pain acu-points placed on the 22 paths of the tree of life). It reduces pain by 60-65% on initial usage for periods of 1 to 2 months, and then it needs to be reprogrammed with updated pain acu-points. In fact, Anna Pon’s carpal tunnel syndrome was healed by an Acu-Brain developed specifically for her. This Acu-Brain works best with the mind instructing the Acu-Brain, namely directing the Acu-Brain to activate the involved acu-point networks and thus it needs to be combined with the health computer. In addition: 22 paths ←→ 22 I-Ching coordinates, which involve the calculation of acu-point’s pre-natal and post-natal conditions in health, karma, etc. In conclusion, the Eureka or the Ah Ha moment is the soul-spirit connected moment: when the observer’s mind-soul observation discovered these 10-D logic models (or their paths of interfaces) in one’s own representation of reality and the symmetry break models at crossover such as the 10-D superstring theory. These Ah Ha discoveries are in turn converted into 10-D line-diagram logic and programmed into God’s Vacuum Computer. 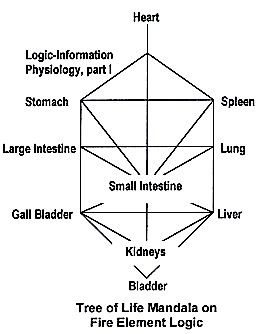 Each nerve plexus contains considerable concentrations of chromaffine tissue, thus indicating the connection of the first Chakra to all other chakras. This connection is through the element Fire, the dominating element of the first Chakra. The element Water dominates the Crown Chakra. Here, the elements fire and water are related to the tridosa physiology of the Hindu. The tridosa consists of the three elements referred to as fire, water, and air. 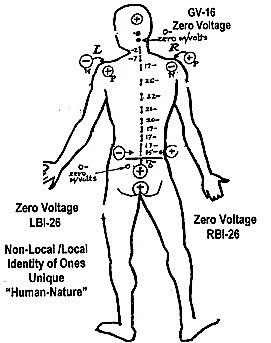 Notice from the soul perspective, namely Chakra physiology, the dipole is a fire-water pair. But from the spirit perspective, namely the acu-points, this dipole is a water-fire pair. 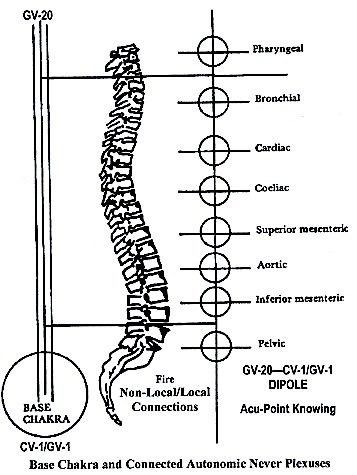 Here, the fire or the Yang meridian is the Du Mai and the connecting point for all Yang meridians is GV-20. On the other hand, the water meridian is the Yin meridian or the Ren Mai. The Ren Mai governs all the Yin meridians and is also known as the “Sea of Yin”. 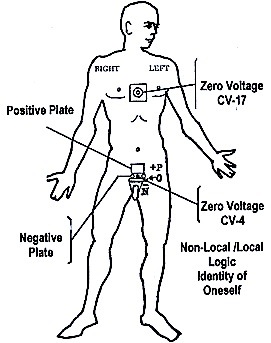 The acu-points CV-1/GV-1 are the pair of points at the first Chakra as shown in the diagram. Therefore, the soul and spirit are harmonized with each other in the perspective that fire and water is contained. 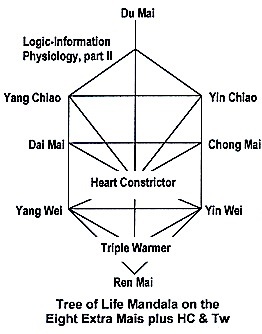 Notice that the Ren Mai is also connected to the St or the Hara, and the Chong Mai or the inner meridian. 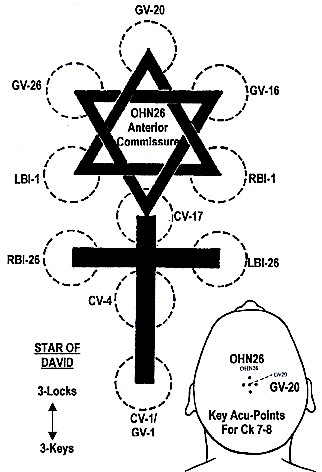 GV-26, the last of the 10 acu-points has to do with the Center of Man, namely, connecting the human as the controlling balance between heaven and earth. As such it is the point that revives consciousness, calms the spirit, clears the brain and heat, dispels wind and wind-phlegm, and restores collapsed yang. Indications: It affects healing for wind-stroke, collapsing syndrome, seizures, shock, heatstroke, hysteria with fainting, facial swelling due to wind, excessive thirst, eye muscle twitches and cramps, lockjaw, toothache, deviated mouth due to wind-stroke, and depression with uncontrolled weeping. This entry was posted on Friday, April 17th, 2009 at 11:19 am	and is filed under 3 Stages of Spirit—Soul—Body Health & Acu-Brain. You can follow any responses to this entry through the RSS 2.0 feed. Both comments and pings are currently closed.